ST. LOUIS --- Boeing's liquid hydrogen-powered Phantom Eye unmanned airborne system completed its second flight Feb. 25, demonstrating capabilities that will allow it to perform intelligence, surveillance and reconnaissance (ISR) missions for up to four days without refueling. During the flight, at NASA's Dryden Flight Research Center at Edwards Air Force Base, Calif., Phantom Eye climbed above an altitude of 8,000 feet and remained aloft for 66 minutes at a cruising speed of 62 knots before landing. The aircraft exceeded what it achieved last year during its first flight when it flew at an altitude of 4,080 feet and remained aloft for 28 minutes. "Today’s combination of geopolitical and economic issues makes Phantom Eye's capabilities, affordability and flexibility very attractive to our global customers," said Darryl Davis, Boeing Phantom Works president. "No other system holds the promise of offering on-demand, persistent ISR and communications to any region in the world, rapidly responding to natural disasters and national security issues." 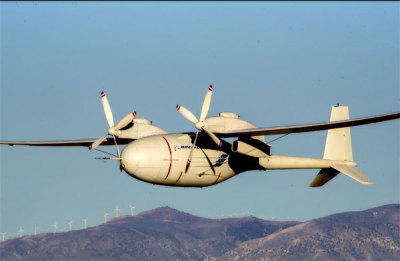 Boeing is self-funding development of the environmentally responsible Phantom Eye, which generates only water as a byproduct of its propulsion system. "This flight, in a more demanding high-altitude flight envelope, successfully demonstrated Phantom Eye's maneuverability, endurance and landing capabilities," said Drew Mallow, Phantom Eye program manager. Following the first flight, Boeing upgraded the aircraft's software and hardware, including the landing gear. The upgrades paid off in the form of a picture-perfect landing. The Phantom Eye demonstrator is capable of carrying a 450-pound payload while operating for up to four days at altitudes of up to 65,000 feet.